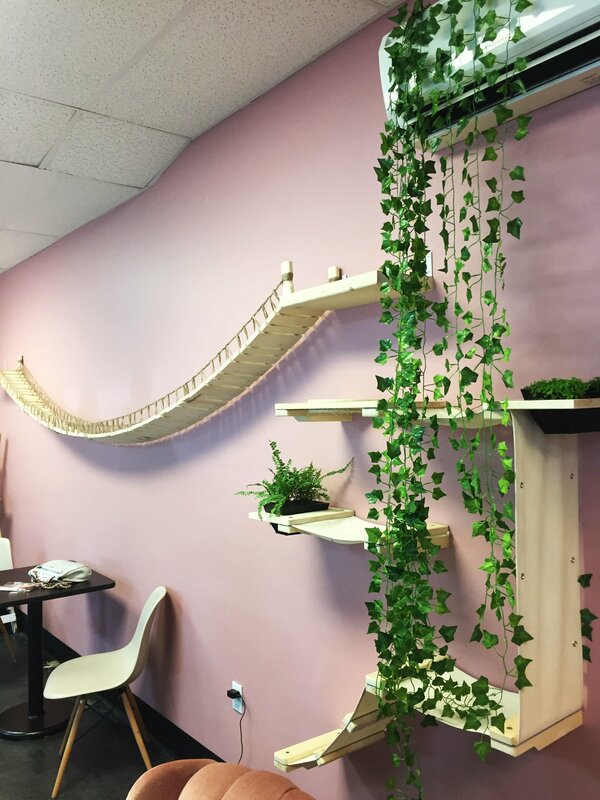 You guys, something really important happened last week – a cat cafe opened here in Tallahassee. 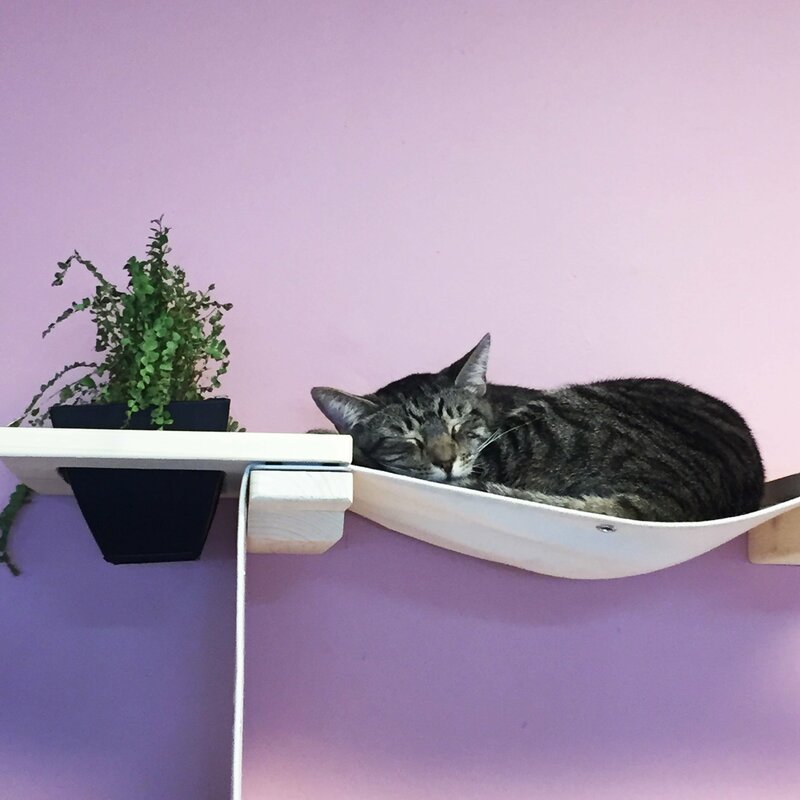 The Tally Cat Cafe, to be exact, and as you can guess, I absolutely had to be at their grand opening this past weekend. Heck, we even made reservations to make sure we had face time with the resident cats. 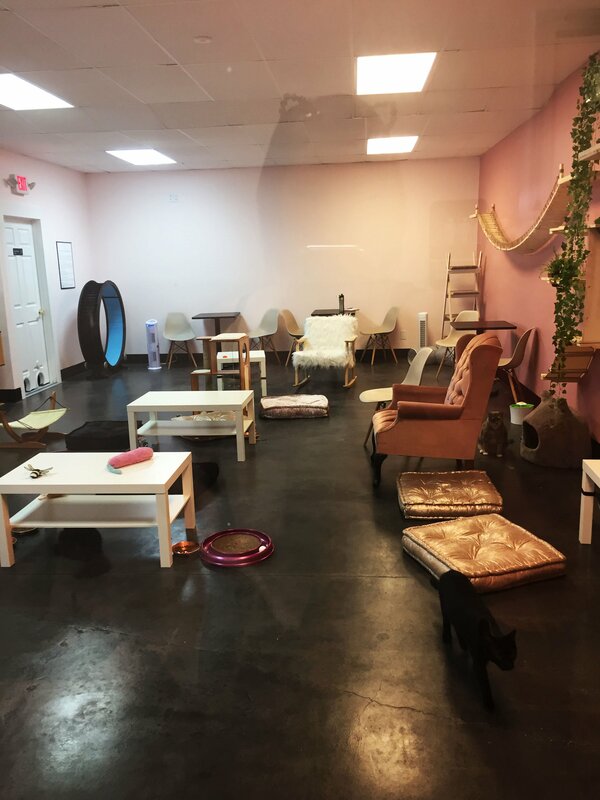 The cafe part of this establishment is on point: plenty of seating (with chairs that look the tiniest bit like they have cat ears) and a bar where you can sip and look into the cat room. The baristas were handling the rush like bosses, helping customers, whipping up beverages, handing out cat ears, and selling merch, all the while chatting with the people in line and making sure everyone was having a good time. 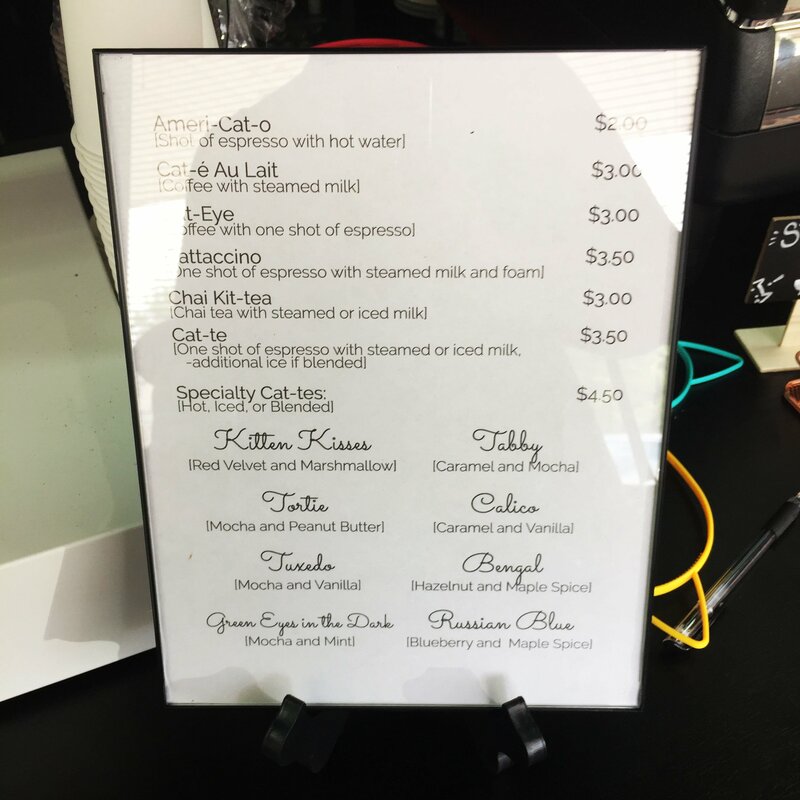 I went for a Chai Kit-tea and a croissant (both were great), and my mom opted for a Cat-e Au Lait and a coffee donut (which I assume were good because they were gone in less than 5 minutes). My friends both opted for blended frozen something-or-others and seemed pleased with the results. 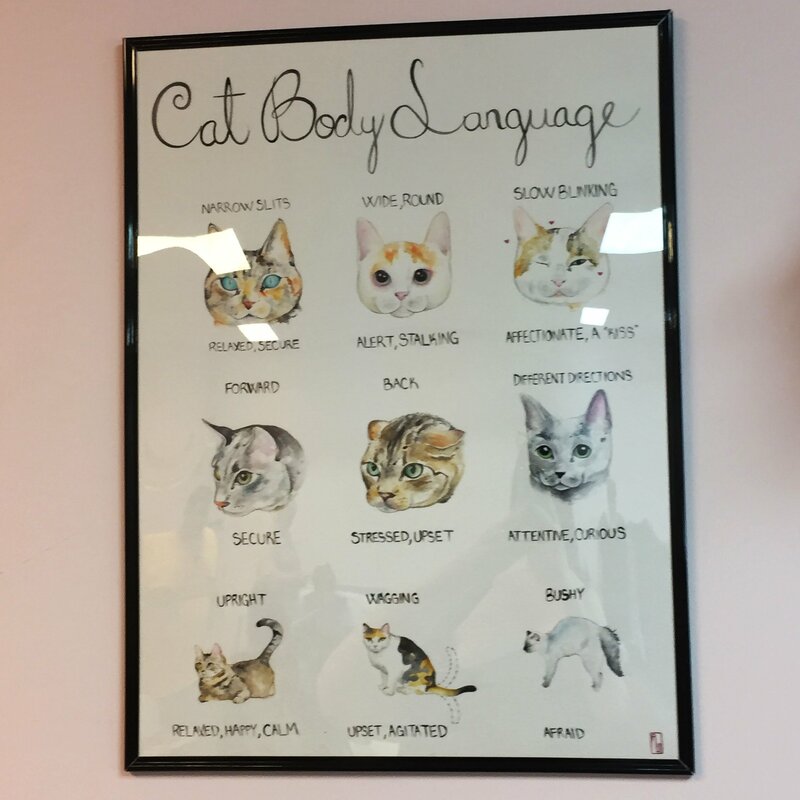 While we waited for our session to start, we milled around the cafe, checking out the artwork (all available for sale), and peering into the cat room to see which fluffy felines were out and about. After a quick list of “dos and don’ts” and a round of hand sanitizer for everyone, we were allowed into the cat room, which is beverage and food friendly as long as you make sure the cats don’t steal any extra snacks from your plate/cup. It was really hard to keep my “MUST SNUGGLE” impulses in check, but I reined it in and took up a seated position on one of the many poufs available. I sipped my beverage and tried to let the cats come to me. I also may have set my croissant in the middle of the table in front of me to lure the kitties in; I figured if they were anything like mine they’d have to investigate. 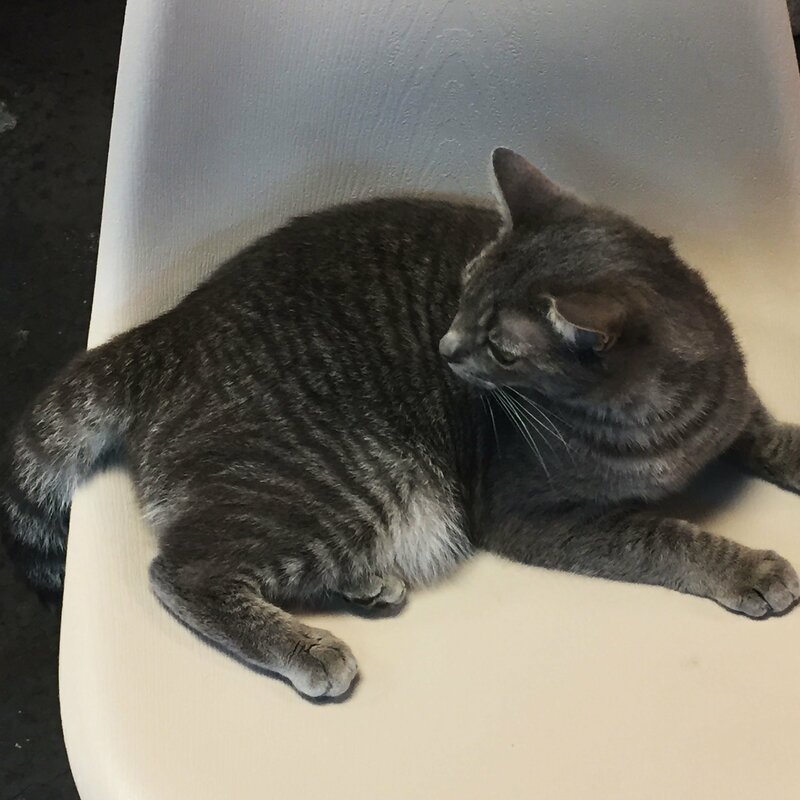 This snuzzy beauty is Charlotte; she napped the whole hour we were in there and could not have cared less about the noisy, needy humans. I thought she was pretty clever – she had one of the best beds in the place and was high enough up most people couldn’t bother here. The indifferent calico below is Beatrice; she is chubby, a little grumpy, and full of sass – pretty much me in cat form. 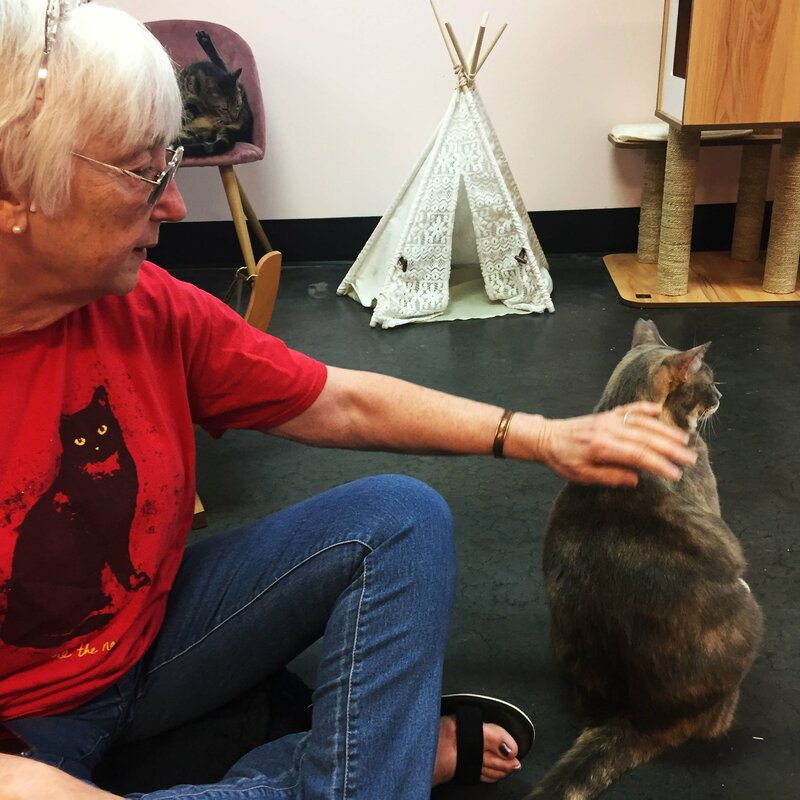 She was undoubtedly the queen of the cat room, and while she allowed us to adore her, she made sure that she moved to the next person after a minute or two to keep us from getting to full of ourselves. 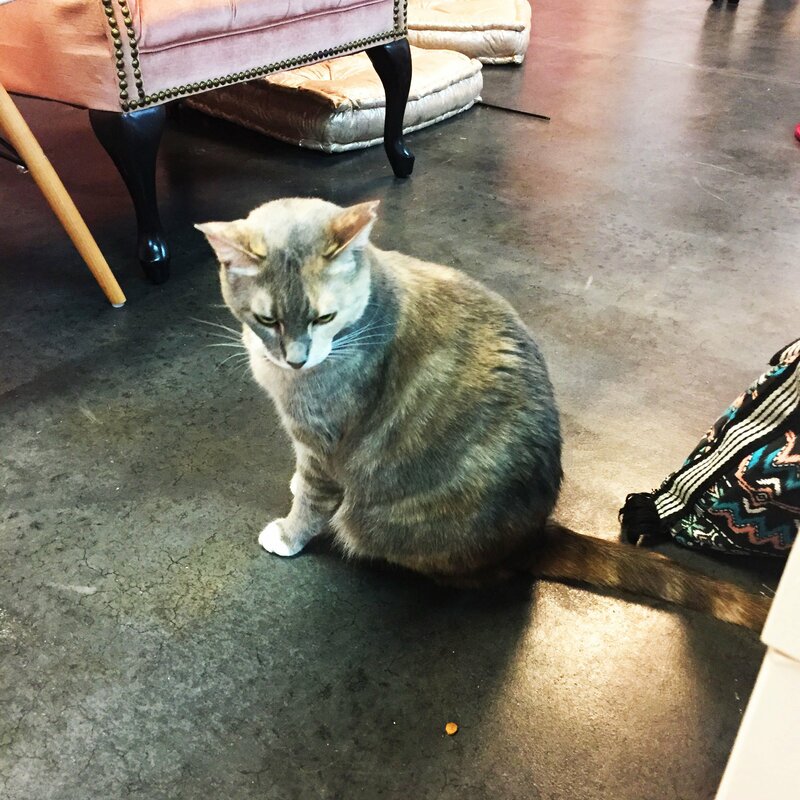 After watching her work the room, we decided that the single name “Beatrice” simply wasn’t enough for this regal creature, so we started referring to her as Lady Beatrice Wobblybottom of the Tallahassee Wobblybottoms. In all seriousness if I didn’t already have five cats of my own, I would adopt her in a second. Sass respects sass. While I was wishing I could adopt Lady Beatrice, my friend Cassie was having her heart stolen by this handsome guy. His name is Vlad, and he has one of the most beautiful plume tails I have ever seen. On top of his glossy coat and inky whiskers, he was a HUGE cuddle bug. Loved the ear and chin scratches and even gave me a kitty kiss on my cheek. It will probably come to no surprise to you that Vlad was adopted two days after we met him; we were a little sad that we wouldn’t be seeing him again, but happy that he found a fur-ever home. 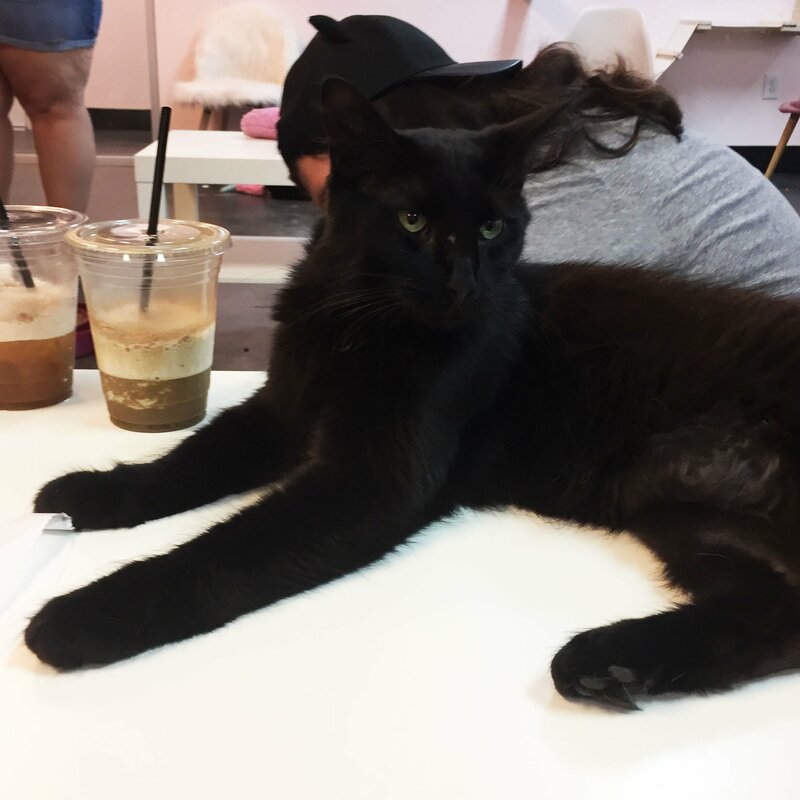 He and his owner were featured on the cafe’s Instagram page, and she looks like she is just as in love with him as we were. I won’t go into our interactions with every cat, but I will say that they were all really sweet playful babies. You think having all of those people around would be a bit much, but they were just so excited to be snuggled and make new friends. Alas, after our hour was up we had to bid adieu to our new friends. I am hoping that I’ll have time to make another visit this weekend. 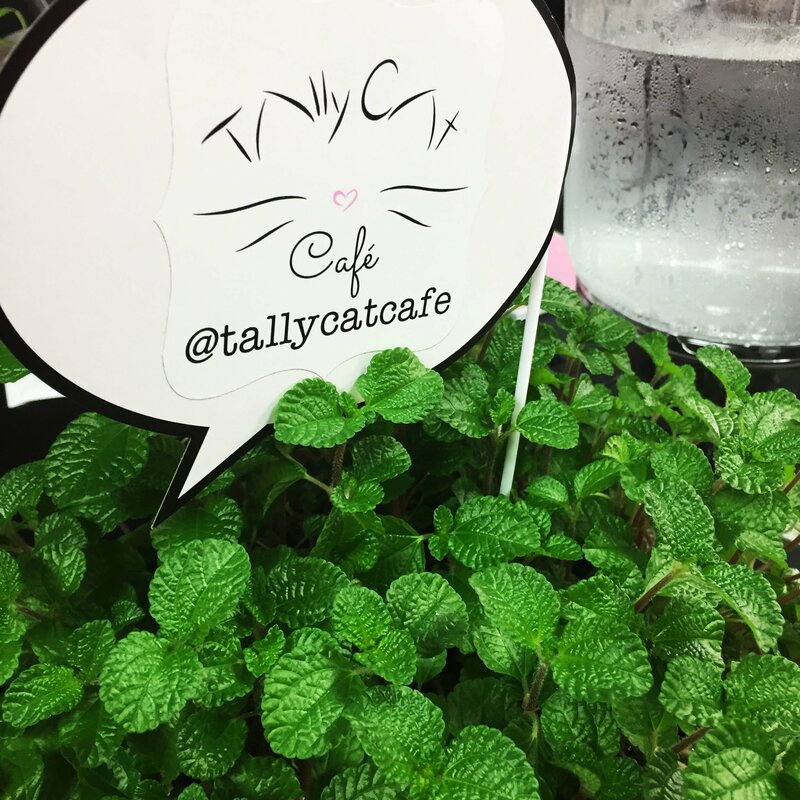 To find out more about the Tally Cat Cafe, you can check out their website or follow them on Facebook or Instagram. They also have information available on how to adopt or for any interested parties. As the Birthday Week Princess, I decreed that we would spend Saturday late morning/early afternoon at the 4th Annual North Florida VegFest. Vegan vendors and educators from all across Florida gathered to celebrate all things vegan at Cascades Park here in Tallahassee. Unfortunately I have some health issues and dietary restrictions that preclude me from a full on vegan lifestyle, but I’m of the opinion that every vegan choice we make is a step in the right direction. I got distracted on our walk from the parking lot and spent about five minutes crouched down taking pictures of the daffodils. I didn’t see one IRL until I was in college, and they still fascinate me. We didn’t get there early enough to secure a free swag bag, but we did manage to catch the vendors pretty much as soon as they opened. The first (and best) purchase I made was from Simply Scented Candles. Homemade, hand poured and metal free, these little guys smell divine, and their creator couldn’t be a nicer guy. We chatted for a bit as my friend and I smelled every last candle. Finally, after much debate, I selected a mini “Grapefruit” and “Watermelon” candle in honor of the warmer weather. The two close seconds were the “Cup of Joe” and the ” Citrus Coconut”. A few corporate vendors had set up tents offering samples, and after trying Peanut Broccoli Salad and some sugar free strawberry jam, my grocery list for the week got a bit longer. Finally, after much browsing, we made it over to the food tents. 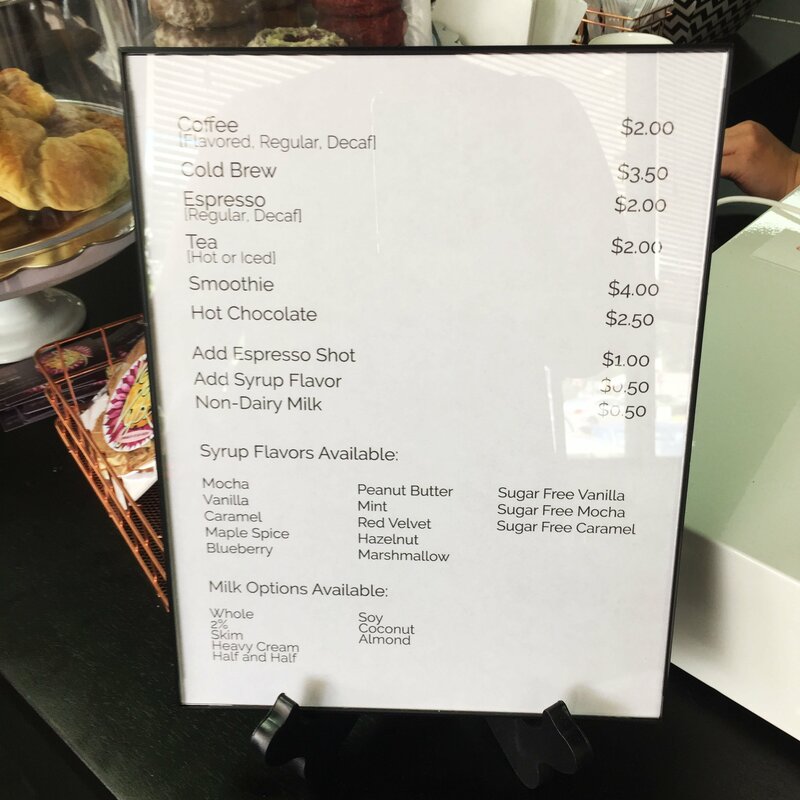 One of the first places I visited was Sweet Pea Cafe – they’re a local place and anytime I get the chance I HAVE to get a couple of their Green Tea Sugar Cookies. They are my favorite cookie of all time. Next door to them was the place I’ll be having my birthday dinner, Nefetari’s. They make a vegan mac and cheese that’ll curl the toes of even the most devout meat eater. Seriously. The real star for us though was an Ethiopian restaurant from Jacksonville called Ibex. I’ve only had Ethiopian food twice before, but you better believe that any time I am going to be near Jacksonville from now on, I am hitting this place up. Everything, and I do mean everything, on their sampler plate was incredible. Things that I don’t normally care for, like beets or greens, I couldn’t get enough of. I actually regret not getting food to take home with us. After loading up on far more food and beverages than we needed, we found a patch of grass near the amphitheater to enjoy our lunch and listen to some of the people who were presenting and performing. Afterwards, we walked around so I could make new furry friends. This may have been my favorite part of the festival. This last little girl completely stole my heart. She is a deaf, a tripod, and the sweetest soul you could ever hope to meet. I may have gotten a little teary after scratching her ears; she has so many disadvantages, but her human clearly adores her and takes excellent care of her. As a parent of several special needs cats, it means a lot to me when I see other people who have animals who are “damaged”. Especially when they so clearly understand how wonderful they are and how lucky they are to have them. We had an absolute blast, and I can’t wait for next year. This was the perfect kick off for my Birthday Week, and I just hope the rest of the week will be able to live up to it. Quite the name, right? This event takes place once a year, and though I’ve considered going in the past, the stars never really aligned to make it happen. This year, however, things fell into place perfectly so Saturday morning my friend Cassie and I found ourselves pulling into the farm at 9 with all the other “gotta get there early” shoppers and handing over our $10 to peruse what is supposed to be one of the best antique and craft fairs in Tallahassee. I have to admit that I underestimated this event a little. I mean, I’ve been to local craft fairs and you can find some really incredible stuff, but the furniture at this event… it’s probably better for my bank account that I couldn’t fit most of the larger items in my vehicle. I would have been HGTV worthy I promise you, oh well… maybe next year 😉 We really lucked out; the weather was gorgeous for most of the morning, which is something that is never a given here in Florida, but it did start to warm up around lunch time. By that point, we’d made our way to the booths that were more small items and crafts. We also made some furry friends along the way, like this sweet guy named Diesel. I think Cassie would have stolen him if she had the chance. I wanted this bed so badly! It was so gorgeously detailed and colorful. The kind of thing that would make Andy roll his eyes, but makes my little hippy heart sing. I bought a lot more things than I intended; one of the impulse purchases was some really incredible soap from a local vendor. I’ll post more information later after I’ve used it for a while and make sure it really is as good as I think it is. On the way out, we picked up a few pastries from one of my favorite local places Trevas, who had a booth stocked with some of their most popular items. We made some final purchases and listened to some music by this talented father and son duo. If you happen to be in Tallahassee around this time next year, you should definitely plan to check this event out. Tallahassee has a new bakery, and I am delighted! Shocking, right? But you heard right, I’m here, I’m chubby, and I like pastries! SoDough opened its doors a week and a half ago, and the buzz around town has been palpable. They have no parking, limited seating, long lines, and it’s worth every damn minute you have to wait. I’ve been twice now for early morning weekend pastry runs with my friends and not a single thing we’ve tried has been anything less than amazing. A group of us got up early and decided to make our first visit at 8 am the day of the grand opening. The line was out the door, but the staff bustled around filling cases, offering coffee cups to people who were planning on purchasing so they’d have something to sip in line. 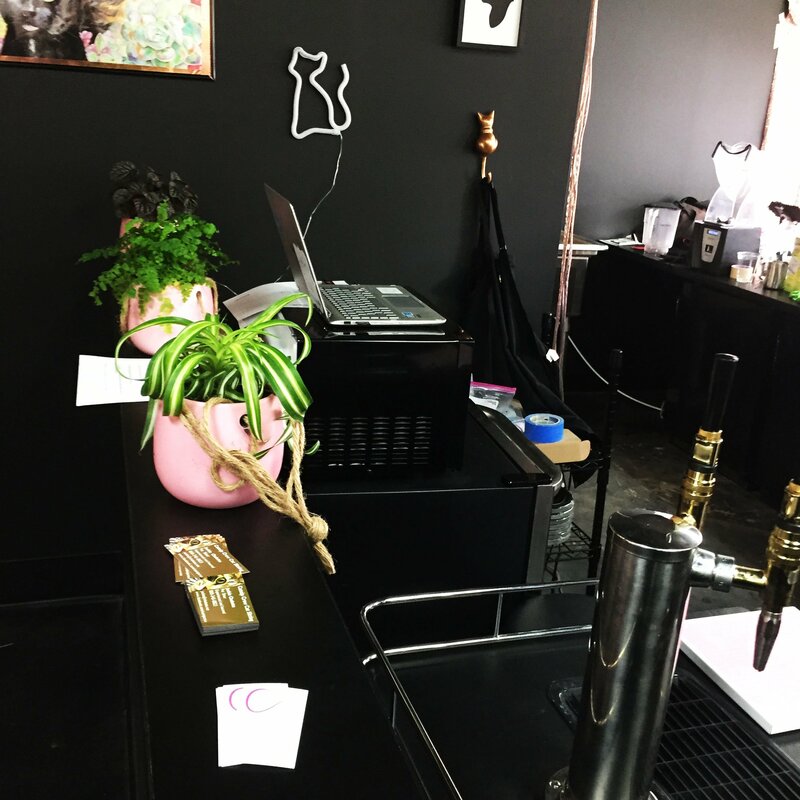 The crew behind the counter was hustling, filling orders, making/decorating donuts, and ringing up purchases, all while being helpful and pleasant to each and every customer. After securing a box full of pastries apiece, we retreated to the seating nook near the window and proceeded to over indulge. We all got a couple different things so there was a lot of “try a piece of this” and “holy crap, this is amazing – you have to try this.” There were also some wordless happy dances performed after trying a bite of something especially amazing. Between what I’ve purchased and what my friends have let me try I can whole heartedly recommend the following: the Strawberry Lavender Sugar Donut, Delta Butter Donut (Andy’s favorite), Key Lime Pie Donut, Chocolate Stout Donut, the Indigo Shibori Bread, The Everything Bagel Kolache and the Mushroom Pastry (my favorite). 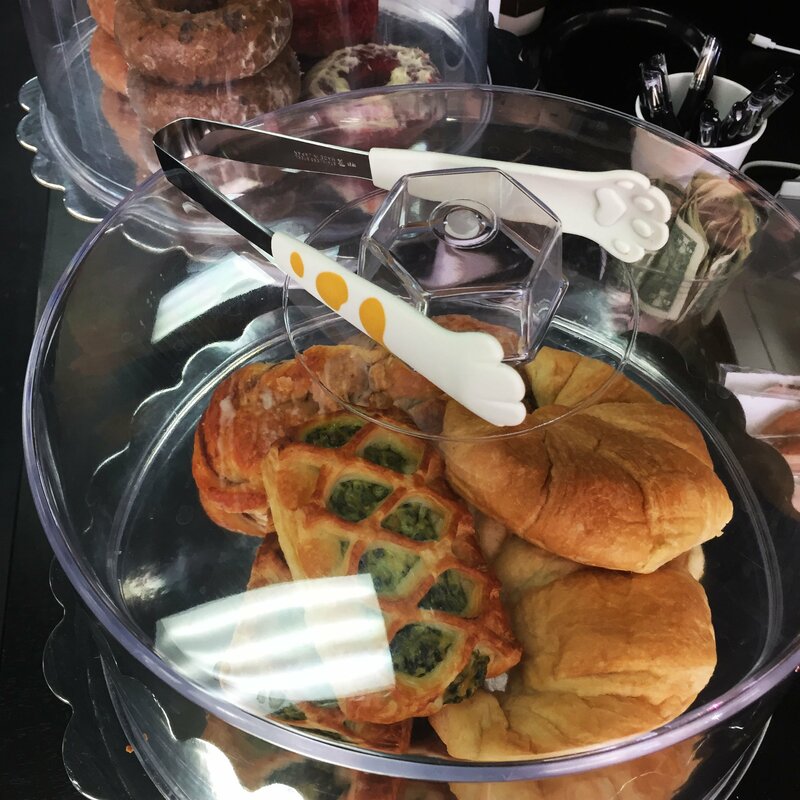 The pastry case always has something new and interesting to try, but this at least gives you a place to start. Since both of my visits have been on the weekends, I am trying to figure out how to get over there during the week to see if things are a little less hectic. No luck so far, but it’s only been two weeks. Good morning readers! Do you like donuts? 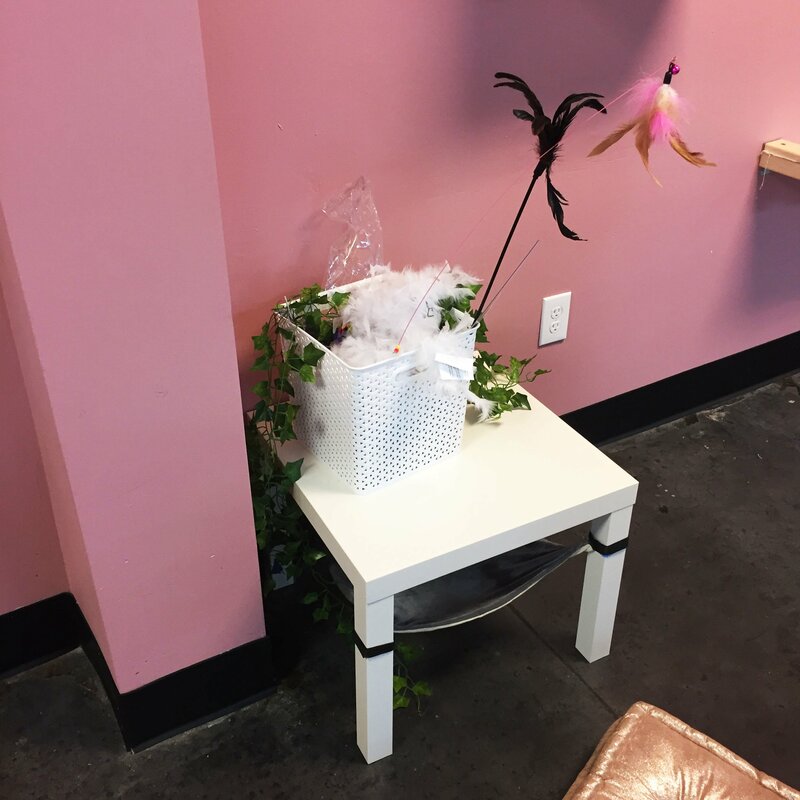 Do you like supporting local businesses? Do you live in/near Tallahassee? If so, I am about to make your day. Allow me to introduce you to Dandelion Donuts! 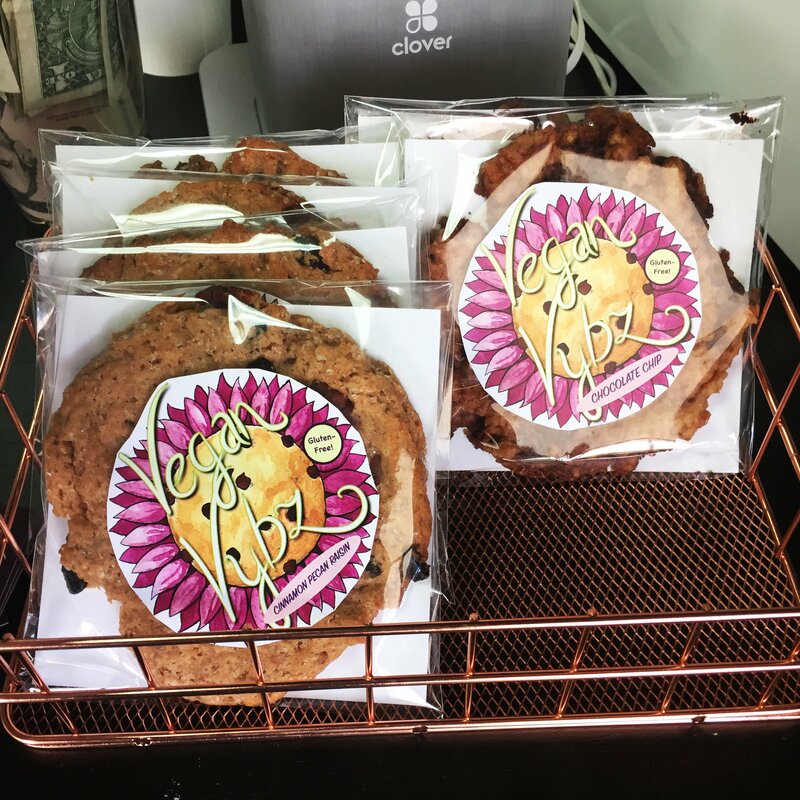 They’re vegan, they’re organic, they’re delivered in a wonderful eco-friendly modified bicycle, and most importantly, they are INSANELY delicious. They had a launch party for their Indiegogo fundraiser this past Saturday at Sweet Pea Cafe, and Andy and I had to stop by and try things out. Strawberry Basil! These were Andy’s favorites by far, and I have to admit that I love how they were delightfully pink without any artificial coloring. The Summer Herb was my runner up favorite. It was perfectly tart and a tiny bit herbaceous. I could eat these all summer long! Double Chocolate with Cocoa Nibs! Me with my favorite, the Maple Facon. I don’t know how I have lived this long and never tried coconut bacon. It’s perfectly crispy and exactly what this donut needs to contrast that rich maple glaze. 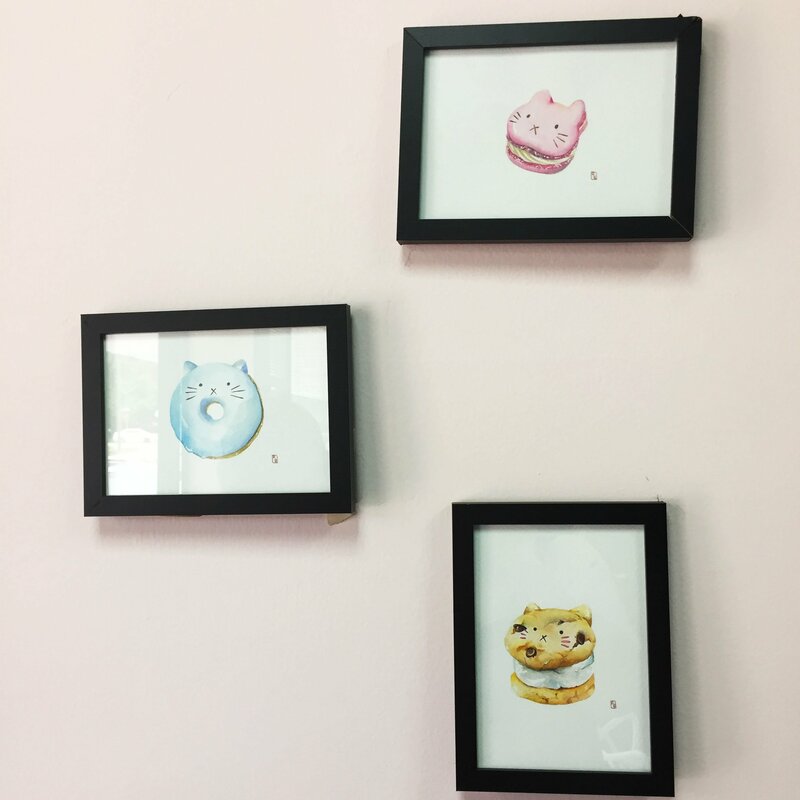 To find out more about Dandelion Donuts and to support this local venture, check out their fundraiser Indiegogo page, and to receive updates on progress and availability be sure to follow them on Facebook and Instagram.